There are endless opportunities in cyberspace claiming to be the “best way to make money online”. Many claim to be the easiest MLM (multilevel marketing) company to make money with. Others claim to show you how to make money fast in network marketing. But, can you make money network marketing? 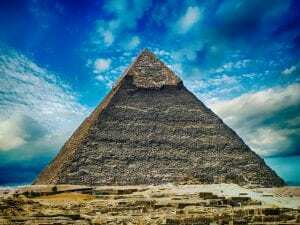 What is the difference between network marketing and a pyramid scheme? Network marketing is another name for multilevel marketing. You probably see friends on Facebook talking about their latest network marketing home business and how great it is. 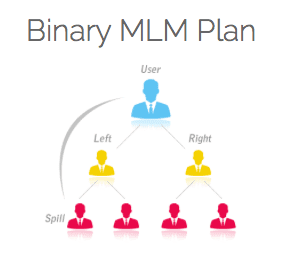 Home businesses like ItWorks, Scentsy, World Ventures, Organo Gold all use Multilevel marketing business models. But what are the differences between MLMs and pyramid schemes? Are you able to spot a ridiculous get rich quick scheme from a legitimate multilevel marketing opportunity? This article (with video) will take a look at network marketing and show why most who jump in fail. I’ll show the most popular network marketing companies out there, the most common compensation plan structures they use, and then go over real numbers from network marketing income statistics that may surprise you. Can you make money network marketing? Let’s see, shall we? Can You Make Money Network Marketing? Watch the video below to fully understand the difference between network marketing and a pyramid scheme. What are some examples of popular MLMs? How do network marketing compensation plans typically work? What is a realistic expectation for someone beginning a network marketing business? And most importantly, is network marketing a good way to make money online? Can you make money network marketing? All these questions and more are answered below. I’m going to cover why I don’t recommend network marketing as a sustainable way to make money online in a bit. There are much better, more straightforward ways to make money without needing to recruit a team. But let’s make no mistake about it. Network marketing opportunities are not the same as pyramid schemes. Network marketing is legal. Pyramid schemes are not. “So is that thing you’re doing one of those pyramid schemes?” This is the question everyone hears when they first jump into network marketing. The fact is, it’s an honest question, and most people actually don’t know the real difference. The difference between network marketing and pyramid schemes is that in a pyramid scheme, money is exchanged without any service being rendered or product being sold. IT IS COMPLETELY ILLEGAL. 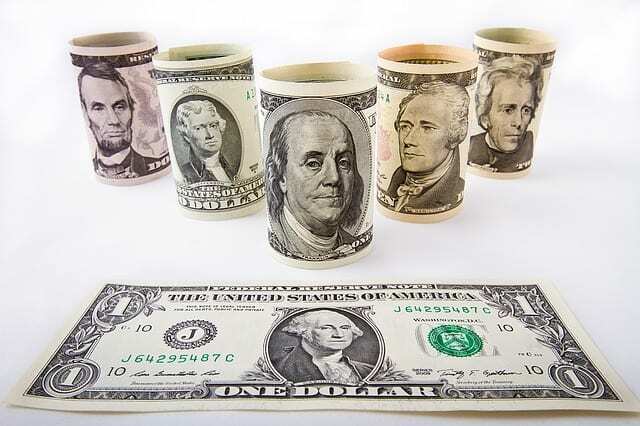 Have you ever heard the story of the man who gathers 10 people together and charges them $100 each so that he can show them how to make a quick $1000? The 10 people each give him $100 and wait with anticipation. Now with $1000 in his pocket, he tells them all to go find 10 suckers who will pay them $100 each. DON’T FALL FOR PYRAMID SCHEMES! Network marketing, on the other hand, involves the purchase of a central product or service. As a representative you will not only buy this product yourself, but also gather customers as well. Additionally, you’ll be recruiting other representatives who want to join your team and sell the product as well. There is an initial buy in price and there are recurring monthly dues. These usually come in the form of an autoship of more product. The recruiting of other representatives is usually done through home meetings where you show friends and family the same compensation plan you were shown. One of the main reasons for its popularity is the idea of getting paid on the efforts of others. You’ll earn commissions by recruiting representatives into your team and also from the amount of product you and your team sell. Sounds great right? Well, let’s dive in a bit further and take an objective look at the numbers. What are the Most Profitable MLM Companies? There are many successful network marketing companies who have been in business for a number of years. However, this doesn’t necessarily mean their distributors are all making money with the business. It simply means that there is a steady growth of people who are buying into the business opportunity. A true measure of what distributors within a network marketing company are making is the annual income disclosure statement provided by the company. We’ll take a look at a couple of examples further down that my shock you. There are many diverse network marketing opportunities that span a wide range of niches. There are literally THOUSANDS out there online. Some have been around for decades, while others are new up and comers. Scentsy and many, many more. The vast majority of all network marking companies follow versions of the same compensation plan. These involve downlines and growing “legs”. Let’s take a look at the most popular network marketing compensation plans. 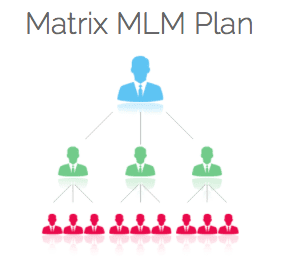 How do MLM compensation plans work? There are several compensation plans widely used within the network marketing industry. It’s always important to research and understand the compensation plan before beginning a network marketing venture. While each specific opportunity can add it’s own nuances to a compensation plan, the majority use the core elements of the unilvel, binary, and matrix compensation plans. 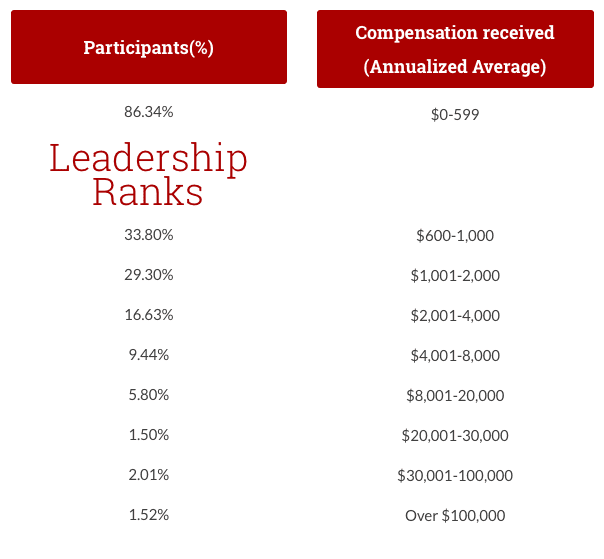 How Does the Unilevel Compensation Plan Work? With this compensation plan you can personally sponsor as many representatives into your team as you like. The representatives you recruit are then free to do the same. It is the simplest of the 3 main MLM compensation plans. You will get the most compensation for the members you personally sponsor. You then get decreasing percentages of your team’s commissions as they get further away from you. In this basic compensation plan there are no ranks and everyone is an equal distributor. No one can surpass someone who’s above them. There are hybrids of this compensation plan like the Breakaway compensation plan. The Breakaway plan allows for a member of your downline to be able to “break away” when he or she meets certain requirements. How Does the Matrix Compensation Plan Work? With the Matrix compensation plan you have a set number of spots open in your team. It is your job to fill them. For example, in a 3×5 Matrix compensation plan, each distributor can sponsor 3 people into the team. They will get compensated up to 5 levels deep. When it comes time to sponsor that 4th new distributor, instead of being able to place him directly to yourself, you have to find an open spot in another level below. This is called “spillover”. This “spillover” feature is one of the selling points of the Matrix compensation plan. If you find yourself directly under someone who is exploding the business, you may be the recipient of distributors being placed in your team. The Binary compensation plan or Dual Team compensation plan allows you to build two teams, or legs. One on the left, and one on the right. It is unique in that it only allows you to personally sponsor 2 people into your team. This allows for a good amount of spillover, thereby helping your downline. The Binary compensation plan has one major downside. You only get paid for the lesser of the two teams. To fully max out this compensation plan you’d need your team to grow out symetrically which is very rare. In other words, if your team on your left leg has absolutely exploded, with 100+ members and growing, while your team on your right leg has only 3 distributors in total, you get only paid on those 3 distributors on the right and not on the exploding 100+ on the left. The real way to answer “Can you make money network marketing?” is by looking at annual network marketing income statistics. This is an objective way to determine how the majority of people fare with a business opportunity. Income disclosure statements are public record, and should be easy to look up and easy to understand. It will show the revenue breakdown for distributors of a company. Unfortunately, the vast majority of network marketing income statistics show that most distributors do not make their money back with network marketing MLMs. A staggering amount make no money at all. Let’s take a look at two different income disclosure statements for network marketing opportunities I’ve written reviews on. The first is for Organo Gold. As you can see, the vast majority of distributors with Organo Gold (86.34%) made an annual revenue of $0-$599. When you take into account the expenses and membership fees involved for this particular coffee based MLM, the earnings is far less than the expenses. Additionally, as with most MLMs it is only the top 1% who make the lofty six figure incomes you see in the business presentations. Now, I am by no means picking on Organo Gold. This is simply one example of a popular MLM. I’m using their own annual income disclosure that they provide and is public record. Another very popular network marketing company that I myself was a customer of is World Ventures. Their income disclosure statement actually fares even worse. In the example shown above, barely a tenth of 1% of distributors earned what I would call full time income ($55k+). A whopping 79.95% of all distributors didn’t earn a single commission: $0. Does this mean World Ventures or Organo Gold, or any of the popular MLMs you see out there are scams? No. You can make some extra income with these opportunities, and if you don’t mind recruiting, then more power to you. Many representatives absolutely love the social aspect to network marketing business and the “pep rally” feel to the business presentations. These annual income disclosures simply show an objective look at the reality of most MLMs. They may be a decent way to make a little extra money, but they’re usually not sustainable. When you need a team to recruit and thrive, but the vast majority don’t profit as shown above, this takes away from the big benefit you were looking forward to of earning on the efforts of others rather than just yourself. Network marketing MLM opportunities appeal to many people looking to work from home. The difference between network marketing and a pyramid scheme is all about the product or service rendered. Legit network marketing opportunities use a number of compensation plans like the unilevel, matrix, and binary compensation plans. Be prepared to recruit, recruit, recruit. Further, they usually claim to have multiple ways for their distributors to earn revenue. They sell the idea of getting paid on the efforts of others instead of only getting paid on your own. Unfortunately the network marketing income statistics don’t lie. Only a very, very, VERY small percentage of representatives will make full time income. The vast majority who get involved with network marketing opportunities do not make their money back. If you’re looking to create a new revenue stream online, there are better, more straightforward ways to build an online business. I highly recommend taking a look at the online training platform and mentoring community I found that opened my eyes to how online business works. There’s no recruiting, no experience needed, and the training and mentorship are second to none. I’ve had nothing but positives from it, and you can try it for yourself free. Check out my experience here as I share how I enjoyed a $4k month in my first year with this platform. Has this article answered your questions about network marketing? Do you know and understand the difference between network marketing and a pyramid scheme? Have you been involved with MLMs in the past? What’s been your experience with them? Share your experience in the comments below. I’d love to hear your story. If you have any questions, as always, don’t hesitate to ask. This article really answered my questions about MLM and network marketing. In Malaysia, a few years ago, there was a well known MLM about stem cell products called Phytoscience. They showed their members making 5 to 6 figures SALE, not profit. During that time, my friend invite me to listen to his upline’s close sale pitch. But just as you showed here, the numbers just didn’t add up. Now, that company almost disappear. I don’t know what happen to them and my friend quit from Phytoscience. Fortunately, I not buy in the sales pitch before so I’m not losing anything now. Great article. Hope this article give clear views about MLM and network marketing to others. Thanks so much for sharing your experience. There are much better ways to make money online than through MLM. Affiliate marketing is definitely a more sustainable business model. No downlines! No recruiting! Thanks for the comment! In the past I tried with Amyway and a new MLM company called BE international. I am their member only because I wanted to buy their products (with cheaper price). I didn’t 100% understand how the model worked before reading your post! Thanks so much for the explanation here. My eyes are opened! Thanks for the comment! While there can be some short term money made through MLM, a much more sustainable model for making money online is affiliate marketing. The training platform I recommend in the article is hands down the best I’ve found online. The commissions with network marketing always plateau and end, with most representatives jumping ship and moving on to the next new thing. Thanks so much for chiming in! I completely agree with your article. I’ve tried a couple of different opportunities and failed because I couldn’t recruit anyone. Probably because I hated to befriend someone just to sell products to them, it was uncomfortable. I’m very, very interested in affiliate marketing. Is it free to partner up with merchants or do they charge a fee? It’s absolutely free to make those affiliate partnerships. And when you have the right training so you know how to get the most eyes on your content, you have the best chance at getting those affiliate commissions over and over and over again. It’s a great industry to be a part of. Hi Eric – Excellent breakdown of network marketing. I do belong to a network marketing company (Young Living Essential Oils) and you’re right. It’s absolutely not a pyramid scheme. But you’re also right that it’s not easy to make money with it. People generally don’t trust network marketing companies. I do like the products, so I hang in there. That’s what it’s really all about. If you can educate people on what the products can do without seeming scammy, then you’re golden. It’s not the easiest of tasks. Have you ever personally been involved with a network marketing company? If so, what did you think of it? Yeah, my introduction into online business was through network marketing years ago. I had success, but with as much success as I had, I found the business model to be an unsustainable one. If someone is looking to have a project they can make a little side money on for awhile, sure, network marketing can be that for them. But as far as full time revenue, the numbers are telling. When you’re building a team where the vast majority won’t be profitable, it’s like you’re building a house of cards that you know is bound to collapse, know what I mean? That’s why I walked away from network marketing and began researching affiliate marketing training platforms until I found one that I couldn’t find fault with 🙂 The key for me is not needing to depend on a team for my commissions, and instead just depending on myself 🙂 Thanks so much for your honest insight and comment! I have been exposed to both the pyramid schemes and network marketing. Though at first it sounded pretty interesting and enticing, I didn’t like the fact of feeling u have persuade someone to join something that u personally don’t have much experience with. Or even selling products that are over price that are not a households basic necessities. I’m really glad you made this post. I’m glad I went with my gut feeling back then. Thanks for the facts Eric. Thanks for the comment! The unsustainability of network marketing compensation plans is the main concern. Anytime you need to build a team for sustainability, you’d obviously need the majority of that team to be successful. Unfortunately in network marketing, this is not the trend. Thanks so much for your insight! I have been involved with a few MLM’s and lost heaps of money with a couple of them. I absolutely agree that the compensation plans they use always plateau and diminish! The teams die down and with it so do the commissions. I feel so fortunate for finding this article because I’m completely intrigued by the affiliate marketing training you mention. I’ve seen “affiliate” tabs on the bottom of sites like Amazon and Best Buy before and never knew what they were for. Going to read your article on affiliate marketing now! Thank you! Thank you so much for your insight. And yes, affiliate marketing is a much more straightforward way to make consistent and lasting revenue online. Here’s 2 links to a couple of my affiliate marketing articles 🙂 Thanks again! I’ve never really taken the time to figure out the difference between Pyramid schemes and network marketing. Prior to this article I have put both in the same category and never thought I could trust the idea. While Herbalife seems very well put together, I know many have tried to follow in their footsteps and failed. Was it do to ill preparation, or just a scheme in general, I did not know. Seeing the breakdown of the numbers is a huge eye opener and very much appreciated! Thank you for this! Thank you for the comment! Yes, the main difference between illegal pyramid schemes and legal network marketing schemes is the product or service being offered in exchange for money. While network marketing isn’t illegal or a scam, the annual disclosure statements put out there by each company really put a reality check on what representatives joining these network marketing companies should expect. In my opinion, it’s simply not a sustainable form of income. Thanks for your insight! Yes, Amway and ItWorks are a couple of the most popular network marketing companies out there. And as you said, while you may be able to get off to a good start and hopefully make your money back from your initial investment, sustained revenue can be very difficult to achieve. The training platform I recommend at the end of the article is hands down the best training I’ve found online. If you’re looking for a more straightforward way to build an online business without needing to recruit, then I highly recommend giving it a try. Thanks so much for you comment! I really like the article as it explains MLM plain and simple. It is absolutely great that you are sharing helping others understand it and so we do not fall victims. Very glad this article helped you, Ana! Thanks for the comment! 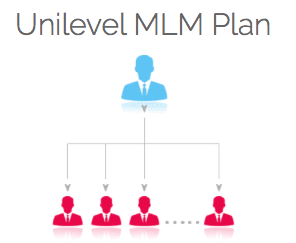 Thanks for clarifying network marketing, more specifically multi-level-marketing. My friend is actually involved in an MLM company selling life insurance. I’m definitely not a huge fan because I can’t see the long-term benefits. From my understanding, MLM is illegal, correct me if I’m wrong. What a greatly informative article you have here Eric. I have been a member of four (4) network marketing companies previously and I have no good news to share about any of them. I hardly made any money from any of them. Even when I did make money, it was nothing compared to the effort I had put in. After the last one I was involved in I almost swore never to get involved in any again, ever! Wealthy Affiliate changed my story. now I don’t have to do network marketing. I’m focused on building my own business around my passion, not looking for down lines. What a great testimonial. Wealthy Affiliate is where I got all my training and I couldn’t agree with you more! Congratulations and continued success! Great article and good research. I have been involved in MLM for over 40 years and have tried many different ones. When you first start off you tend to make money if you work at it 24/7 which I did, once you slack off then everything stops. Also if your downline decide to quit it can take a big chunk of your business. I know lots of people who are making good money with MLM but they have been doing it for years and years with the same company. It’s one of those things that when it works it is great when it does not then it is very expensive. I agree. There are some short term opportunities for profit, but in the long run, the plateau and diminishing returns are inevitable. Thanks for the insight! In the recent study, when a MLM had been in the market for 10 years, 90% of the members will likely fail in their business, i.e: making little or negative profits, leaving only 10% doing well. From my 2 years experience being in one, MLM maybe legitimate but became hard to make money when the members became greedy, all the hard selling & recruiting made people to shun you the moment they found out you are doing one. I can see in future, this will only get worse. I am seriously considering to start with WA. So far I am enjoying the Free Membership, love the training and helpful community. Thank you very much for introducing this amazing online business to me! Eric Thank you for this nice post. I have heard of MLM but I never knew there are different MLM. I like how you explain the difference between network marketing and pyramid schemes. Your post is very informative. I have been looking at network marketing for quite a while now but I got burned with some online schemes so I have been very skeptical.. I have to admit that your post is showing me that there is still legit companies around! Is there any particular one you could suggest me? Great post! Thank you for clearly defining what a pyramid scheme is and why it’s illegal. I hear so many people talk about MLMs as if all of them are pyramid schemes. But that simply isn’t true. There are a lot of great MLM companies out there that truly want to help better people’s lives. But, like you explain, network marketing is not the best way to make money. I appreciate you including the income statistics. This clearly shows how few people actually succeed in network marketing. I signed up with a network marketing company a couple years ago because the idea of working from home appealed to me, but I quickly found out that recruiting people was not something I wanted to do. I still buy the products, but don’t sell or recruit. Thanks for the comment, Weston! Yeah the Income Disclosure Statements really do speak volumes when it comes to the realistic expectations you should have with any MLM. I prefer a much more straightforward way to build an online business, personally, but just as you said, there are several opportunities out there with MLM that aren’t half bad and can actually be worth it for the short term as opposed to the long term. Very happy this helped you, and sorry you didn’t find this in time to save you from losing your $200. You live, you learn, right? I appreciate all the support 🙂 There are much more straightforward ways to make money online. Glad to be of help! I’ve tried Amway products before and they’re not bad. I wasn’t aware that Thrive is also a network marketing business. Thanks for sharing! Yes, a lot of the products they offer are decent. And not just from Amway, but from many MLMs. It’s just that the numbers consistently reflect that it’s hard to sustain a profit growing a team when you already know around 80% of them aren’t going to turn a profit with their business. That’s why I prefer a more straightforward approach to online business where I don’t have to depend on others for my commissions. I appreciate your comment and insight! Thank you! I really appreciate the kind words, Brandon! Thank you! Some companies are worthy to join, but with the stats you show of how very little make it big are so true. It is something I am not going to be a part of again anytime soon. I think with the majority of distributors making some income, keeps most of them motivated and – “your big success is just round the corner, just keep going” (the inspiring words from the top 2%) – when really it is not. Good article and you do keep it real. It must be nice to be part of something that you dont have to recruit people and you are not upsold every corner you turn! You’re definitely right about that. Thanks or the comment, Sharon! Being an old guy, i have tried a few money making opportunities. Amway was one, where i tried 3 times, over the space of 20 years, to become successful. Each time my upline failed me, and promises i made to customers, could not be kept. They only had about 5 well priced/quality products anyway, that were my main sellers. I vowed never to work for companies with these structures like Amway ever again. Your idea of affiliate marketing/internet marketing is the one i’m trying now, and i am much more confident of success in the long term. Agreed. For the long term, MLMs tend to plateau and you lose the momentum you started with when it comes to your team’s growth. With affiliate marketing, your growth is more sustained and you don’t have to worry about anyone else’s actions for you to succeed. Thanks for the comment! Hi Eric! Loving the video- I know a lot of people who are doing network marketing. I am happy that I have taken another direction personally and do not have to deal with any products or people in the ways that they have to. I see so many people who get into it completely pumped, only to be fizzled out 6 months later. I really love using a platform that has helped me to create my online business in a way that keeps me true to myself and others. If there is anyone out there reading this, I definitely recommend that they get started with the free trial.. are you able to provide the link? Thanks, Andrea! Wealthy Affiliate has provided me with nothing but positive results and a great online community to learn from. I’m glad you’re enjoying it 🙂 Here’s my full review of the platform for anyone interested: Wealthy Affiliate Review 2017. I’ve never heard of MLM until reading your article. It’s a real eye opener, seems like you have to convince others to help you ? if that fails so do you. That’s no way to risk your job thinking your going to make a good living. You may not have heard the term “multilevel marketing” but I’m sure that once you saw some of the popular once you recognized those companies. It’s such a growing industry because so many buy into the dream of working from home, but there really are better ways to build a successful business online without recruiting. You’re absolutely right with what you said. Thanks for the comment! Eric, a very good article. You’re correct a pyramid scheme is just that a scheme or scam. A MLM offers a product therefore, is legal. However, I am noticing pyramid schemes are now “disguising” themselves as being more of a MLM. They are still a scam. I joined one (can’t remember the name) that was offering a “product” (like MLM), but they were still taking from Paul to pay Peter – too late for me after I realized what they were doing, got scammed. MLM are not much better. They do offer a product(s). But usually the ones that make the money are those who join early. The other thing that’s bad about MLM is that you have to keep recruiting (as you mention in your article) to make up for those who leave under you. I wouldn’t touch MLMs (unless I could get on the ground floor), there are much better ways to make money. Agreed. I’m not a subscriber to the “I’d rather get paid on 1% of 100 people’s efforts instead of on 100% of my own” mantra, because I know what I’ll bring to the table and don’t want to depend on 100 other people to have to produce for me to get paid. I’d much rather be in full control of what I’m doing and with a much more straightforward compensation plan. Some MLMs might be a good investment for a quick profit, but they always tend to plateau in the long run. Great information! I have been looking into network marketing for quite some time and I’m glad I came across your article. There’s always been something in the back of mind telling me to find another way because I’m just not a person who wants to recruit and turn all my conversations into my home business like so many of my Facebook friends are doing. It’s so annoying! I’m going to look into your recommendation. How has your experience been with it so far? Do you find that you need to spend 8 hours a day, or would it be safe to say that I could try 4 hours a day and hope to get somewhere with network marketing?